Order an original ¼ oz 1987 Chinese panda gold coin for a low price from our online store to secure your wealth in ounces. Votre commande de pièces d'or Panda pourrait bénéficier de la livraison gratuite. Official panda gold traces its heritage to the first 1983 People’s Republic of China mints in Shenyang (Y mint mark) and Shanghai (S mint mark), and features a unique reverse design which changes annually. L'image sur la pièce Panda 1987 met en valeur un panda s'abreuvant à l'étang dans une forêt de bambou. Its obverse side includes "People's Republic of China" written in Chinese characters, along with the year of mintage and a picture of the Hall of Prayer for Abundant Harvests in the Temple of Heaven, Beijing. Panda’s are a symbol of rarity and purity, and so are these official coins. Achetez votre pièce d'or Panda dès aujourd'hui. 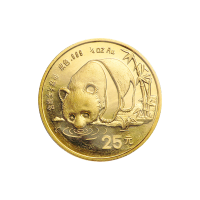 Pièce d'or Panda chinois 1987 de 1/4 d'once Order an original ¼ oz 1987 Chinese panda gold coin for a low price from our online store to secure your wealth in ounces. Votre commande de pièces d'or Panda pourrait bénéficier de la livraison gratuite. Official panda gold traces its heritage to the first 1983 People’s Republic of China mints in Shenyang (Y mint mark) and Shanghai (S mint mark), and features a unique reverse design which changes annually. L'image sur la pièce Panda 1987 met en valeur un panda s'abreuvant à l'étang dans une forêt de bambou. Its obverse side includes "People's Republic of China" written in Chinese characters, along with the year of mintage and a picture of the Hall of Prayer for Abundant Harvests in the Temple of Heaven, Beijing. Panda’s are a symbol of rarity and purity, and so are these official coins. Achetez votre pièce d'or Panda dès aujourd'hui.